I’m having a hard time believing it’s fall already. Thanksgiving is just a few weeks away, so I thought it might be a good time to learn (again) how to cook a turkey. My mother has been trying to teach me for years. When I first got married, she hoped I would try to impress my new husband with some new-found turkey skills. It didn’t work out so well back then. So it’s time to try again. I’m feeling incredibly blessed that I have my mother here to teach me. 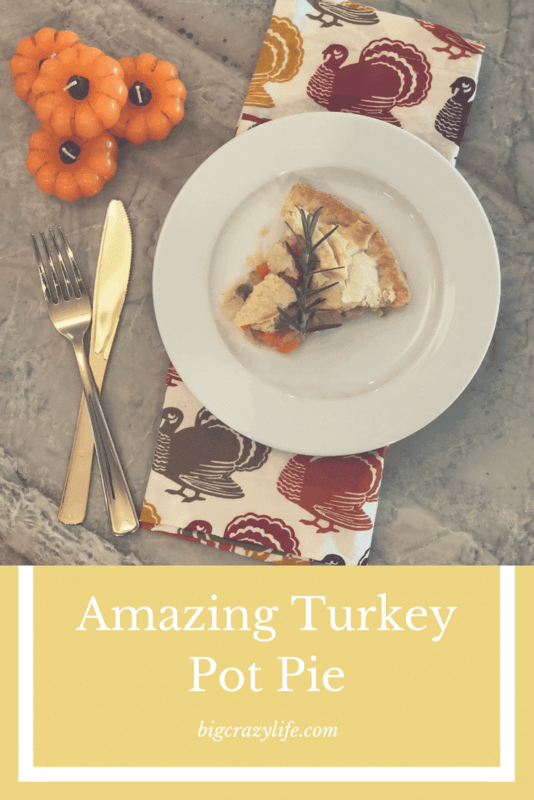 It’s time to roll up my sleeves and get a little dirty in the kitchen because from that turkey comes the most amazing turkey pot pie. I’ll be honest, I don’t like making the turkey and don’t know a whole lot about it. I usually leave the turkey up to my mother and take care of the fixings. This time, my mother advised me to get a bigger turkey than what I actually need for a single family meal. 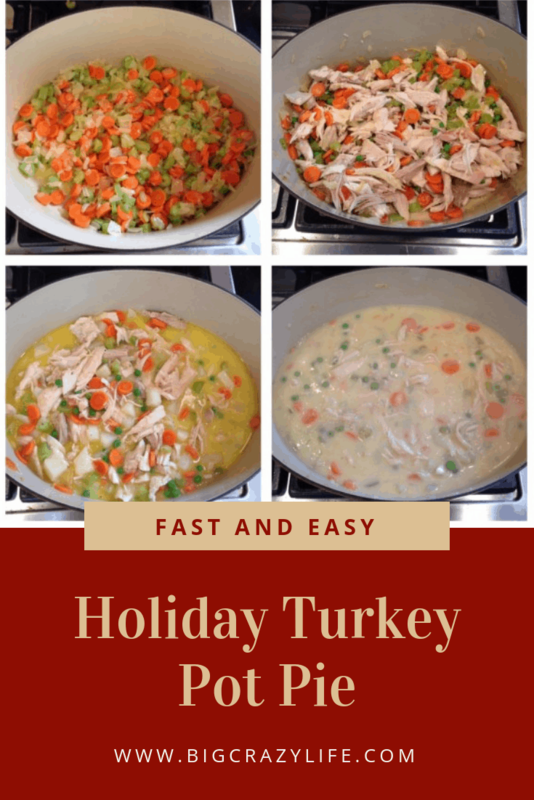 With a larger turkey, I can make several dishes to freeze and store for make-ahead meals. 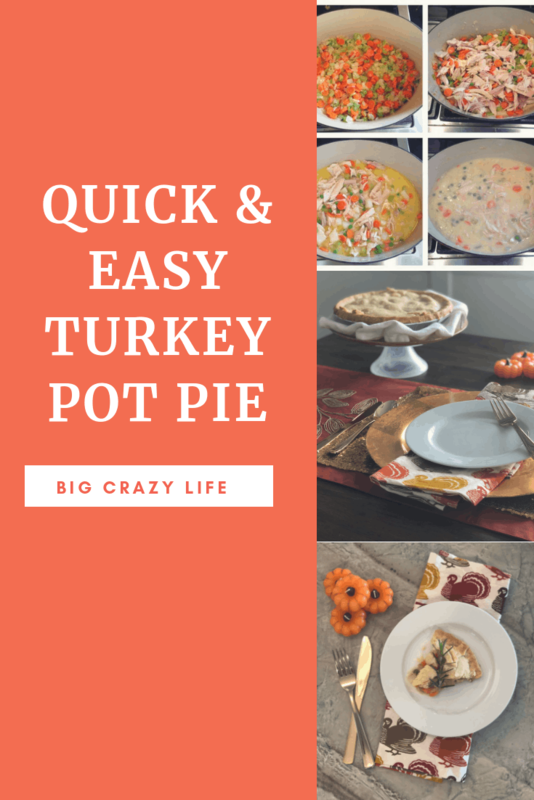 One of my favorite recipes is a turkey pot pie. I make several of these at a time and keep them in the freezer. They’re perfect for the chilly winter months ahead and I can just pull it from the freezer and pop it in the oven. The one I make is super quick, easy, and delicious. Wrapped properly, you can keep these in the freezer for up to six months. Preheat oven to 350 degrees. Melt butter in a dutch oven or saucepan and cook the chopped onion, celery, and carrots until the onions are translucent. Add in the peas and your freshly cooked turkey, simmer for 2 minutes. Sprinkle in the flour and cook for another 2 minutes. Add turkey stock and turn heat to medium for 10 minutes. Add in potatoes and cook until the potatoes are tender. Add poultry seasoning and cream. Let simmer for 5 minutes or until mixture has thickened. Poke a few holes in the bottom of your pre-made pie crust before you pour in the mixture. 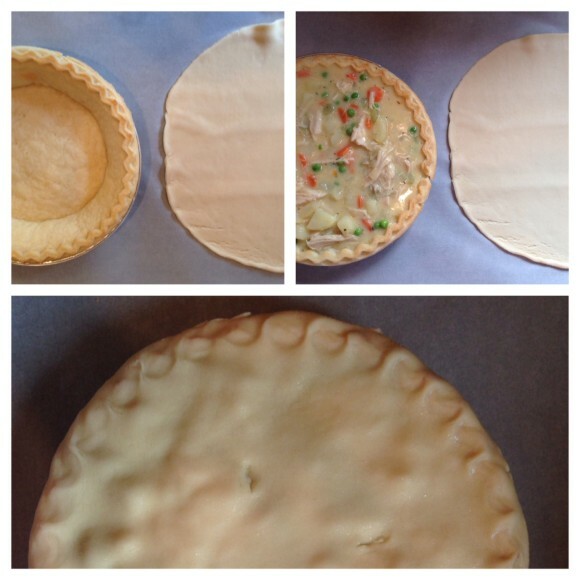 Top with another pre-made pie crust and brush with egg wash. Make a small slit on the top of the pie. Feel free to make your own crust. But, I should tell you, this is the easiest way to do it. Make sure the sides are sealed around the pie, then bake for 20-30 minutes until crust is golden brown. Remember, everything is already cooked, so make sure you don’t over brown your crust. I’ve been making this recipe for years. 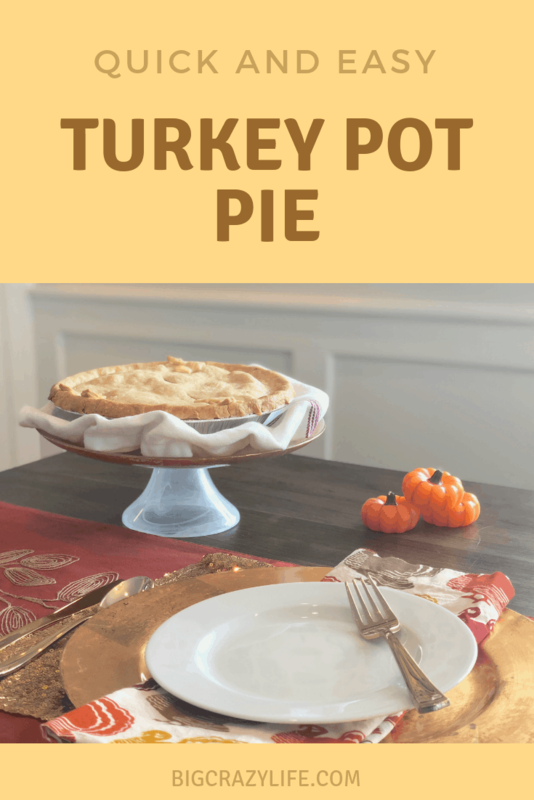 It’s a family favorite and a great way to use up any leftover turkey you have. Plus it makes life so much easier to have these on hand when you just don’t have the time to figure out what’s for dinner. One thing to note, when freezing make sure you are wrapping in parchment paper, then foil. After it’s wrapped, I stick it in a jumbo freezer bag. You can freeze for up to four months. I made this tonight OMG DELISHHHHH best potpie recipe ever, except the potatoes need to go in a bit sooner that is my only suggestion! :) Otherwise this is a grand Slam!